Glenavon manager Gary Hamilton delivering team tactics. Pic by PressEye Ltd.
Managers may always rank derby pride below the drive for points but the stakes will hold even greater significance this weekend when Portadown make the short trip to face Glenavon. 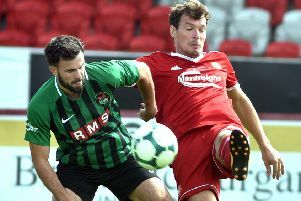 The first meeting of the Irish League season between the two major Mid-Ulster clubs arrives at a point of diminishing returns across the initial months of the Danske Bank Premiership campaign. The clubs entered this season with contrasting goals - Glenavon bolstered by the arrival of former Northern Ireland international Paddy McCourt and tipped to mount a title challenge but Portadown facing a relegation battle due to the 12-point deduction imposed by the Irish Football Association and inability to sign targets on professional terms. They now share a common need for victory following September’s form to forget. The Lurgan Blues kicked off the month with defeat to Ballinamallard United before losing leading positions in three successive draws. Goalkeeper Jonny Tuffey is struggling with a back problem and Gary Hamilton must also reshuffle the heart of his backline following concerns over David Elebert and Simon Kelly. Andrew Doyle is unavailable and suspension has ruled out Kris Lindsay. “Potentially we could be without a goalkeeper and four centre-backs,” said Hamilton. “We must not look at the league table and under-estimate Portadown. The Ports will be hoping for improved fortunes on the road off the back of three defeats at home inside eight days. “We have not been able to put together complete performances on a consistent basis and I think that comes down to a combination of problems with confidence and fitness,” said McGibbon. “But momentum is important and a win can obviously help.